Kitchen and Residential Design: Papasan can you hear me? How is this new? And how for that matter is this attractive? By Fendi Casa as seen in Trendir. perhaps I have too much, ahem, junk in the trunk, but I hated getting out of those old Pier 1 pappasans. No way to do it in any coordinated type of movement. No way to do it with any kind of grace regardless of the contents of one's trunk. I wonder if that troubled fridge of yours is secretly a product of Fendi Casa, like this "new, improved and horrifically expensive" papasan. Big Bird would love this! I'm having a lot of trouble understanding the picture. 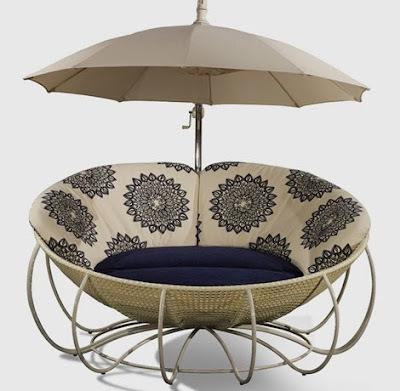 (I had to look up papasan too -- I think they were called moon chairs here; I have seen them, but they certainly don't look like this one.) Are your legs supposed to stick up in the air when you sit in the thing? You're supposed to sit in the lotus position more or less. Either that or curled up into a fetal pose. Papasans were common to the point of omnipresence int he US 30 years ago. They were cheap, exotic and an easy way for bourgeois people to think of themselves as free thinkers. They were also wildly uncomfortable and impractical. It kills me to see them attempting a comeback. I am waiting for Fendi Casa's bean bag chair for 5 with umbrella. Then my life will be complete. It's a papasan from Pier One circa 1978. Start haunting garage sales.